Through Trilok's deep integration of arts and sciences, we uphold a commitment to "green" explorations and creations. Not only do we recycle, but we "Re-Psyche-ALL." As a Cambridge International School, Trilok educates its students to an acclaimed academic standard that is interwoven with our rich Arts, Sciences and Humanities program. Our students receive a well-rounded and progressive education that is devoted to the fullest learning and creative potential of each child. 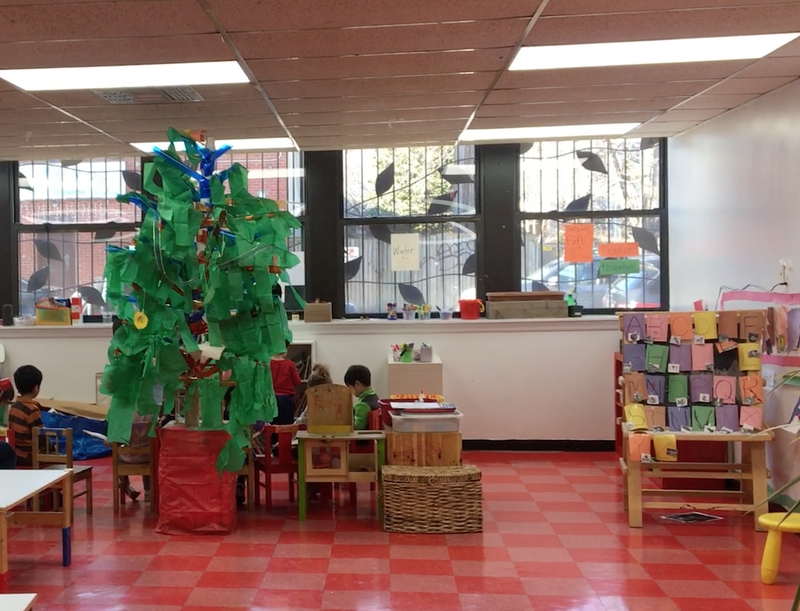 Trilok chooses the support of Cambridge International in order to fully serve the international community of Brooklyn, recognizing that the strength of our process-oriented curriculum is in sync with and supported by Cambridge standards. Find out more about Cambridge International Schools. Trilok’s ‘three world’ structure describes, not only the three elements of educational community (child, fami- ly, educator), but the interweaving fields of study that create a complete education: the arts, the humanities, and the sciences. Here these disciplines work together hand in hand in hand. These three domains of study braid together a liberal arts education that integrates and strengthens each child. Within each child, the “trilok” of their very being is awakened: Mind, Heart and Body. Nature is our life-long teacher. Throughout the year, Nature anchors our curriculum. Curious wonder about the world is cultivated, and the quests of children are pursued with studious attention. Supporting different stages of maturity, Nature’s own lessons are explored and understood at varied levels of complexity and depth. Children of every age practice thoughtful care in their attentive study of Nature’s elements, plants, animals, and mysteries. Through this work, children learn to care for themselves, one another, community pets and plants, and the Earth as a whole. Through practices of observation, appreciation, and contemplation, children safeguard their connection to the Earth as their home. Through experimentation, they engage in sci- entific inquiry as they take a very close look at Life’s processes. Trilok School’s garden abounds with opportunities for planting and harvesting, giving children direct access to ecological lessons of food, health, weather, and the cycle of life. Children learn how humans’ interdependence with the elements of air, water, fire and land mandates our care of Earth. They learn how the global health of the Earth impacts the overall health of its people. Ethical learning develops through school wide humane practices of environmental conservation. At every level of engagement, environmental awareness is studied and cherished and practiced. Trilok School includes a focus on environmental conservation, teaching our students about gardening and the three R’s: (Reduce, Reuse, Recycle). Students learn how to go “green” as humans sharing the big home called Earth. Artistic activity is a cornerstone of Trilok learning. Creative arts are vibrant and consistent at Trilok School. Diverse arts practices are integral to the processes of learning in every dimension. Through the arts, children develop the fine motor skills of manipulating visual art materials, the gross motor skills of full body dancing, the sensory skills of musical training, and the mindful skills of focus, imagination, and intention. Teaching artists from varied artistic fields offer Trilok children an enriching palate of artistic study. Upon entering the school, one experiences the creative voices of children evidenced on many dimensions, from art on the walls to rehearsals in the dance/music studios. Diverse arts activities enhance all areas of the Trilok curriculum daily, allowing hands-on, activity-based learning to soar. Visual/textile/technological Arts: Textile arts, most specifically, the art of weaving, is a cornerstone of the school’s creative voice. The meditative and colorful quality of this art form is an emblem of Trilok school val- ues, tying Trilok consciousness beyond Gandhi toward ancient cultural roots of grounded self-reliance. Textile art classes, as well as visual art projects that use a wider palate of materials and concepts, invite children to recycle and reuse materials, bringing a unique and powerful “green” consciousness to creativity. Through diverse visual art workshops, children encounter an ever broadening range of tactile experiences that bring materials into play with imagination. Technology workshops offer children expanded modern applications through which to funnel their ideas. Motion Arts: The body, as the instrument of being, is engaged fully in the learning processes at Trilok. Within a given week, Trilok Children study a wide variety of performing arts from Music and Theater to Dance and Circus. The arts enhance explorations of all subject areas, allowing children to learn in a multi-sensory, activity-oriented fashion that engages the brain holistically. Exciting Seasonal Performances bring families together for school-wide, multi-media performances by children, which evidence the amazing artistic oppor- tunities children engage in at Trilok. These performances which take place in December and June, (as well as monthly during summer camp) also offer our children the supportive opportunity to experience the growthful challenges of performance. Trilok’s international culture dovetails with its global awareness. International Peace Day in September and Earth Day in May unify our humanity and ground our calendar in celebrations of universal values. Activi- ties honoring other holidays emphasize inclusive, non-commercial, values-oriented, nature-based, communi- ty-building themes. Winter and spring performances invite families to witness each budding child within the context of their accomplishments. Within our diverse community, grows a deep and strong humanity. Empathy and compassionate care for all of life are qualities fostered in our school culture through daily practices, skills, and values. All ages are sup- ported to learn from one another in this human family. Each human being’s growing wisdoms are cultivated toward expression and dialogue. Character development and ethical learning develop consistently through interactive play, community care, reflection, role-play, humane practices of environmental conservation, and studies of cultural heroes and history. Trilok’s “House Structure” provides children with a warm and aspiring relationship to world heroes, encircling their development in a historical framework. Through such study, children develop a strong understanding of their responsibilities to self, community, and world. They develop a sense of belonging to the great family of Humanity. AGES AND CLASS SIZES: Trilok School serves every kind of family. We welcome children as young as two years old, through grade eight. Growing with it's oldest students, Trilok expects to accept High School applicants for 2020. Trilok's teachers work collaboratively to meet the needs of the school, keeping a low teacher/student ratio. Children are assigned to classes based on development, maturity, and needs; and move from class to class as needed, rather than only at the start of the year.